How to watch The Fear of 13 (2015) on Netflix Austria! 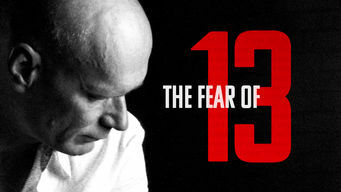 Yes, The Fear of 13 is now available on Austrian Netflix. It arrived for online streaming on October 4, 2017. We'll keep checking Netflix Austria for The Fear of 13, and this page will be updated with any changes. After 20 years on Death Row, self-educated inmate Nick petitions the court to be executed, then tells his twisting, turning tale of despair and hope. Death Row convict Nick is a puzzle. Who is this man? What did he do? What didn't he do? How do the pieces fit together?